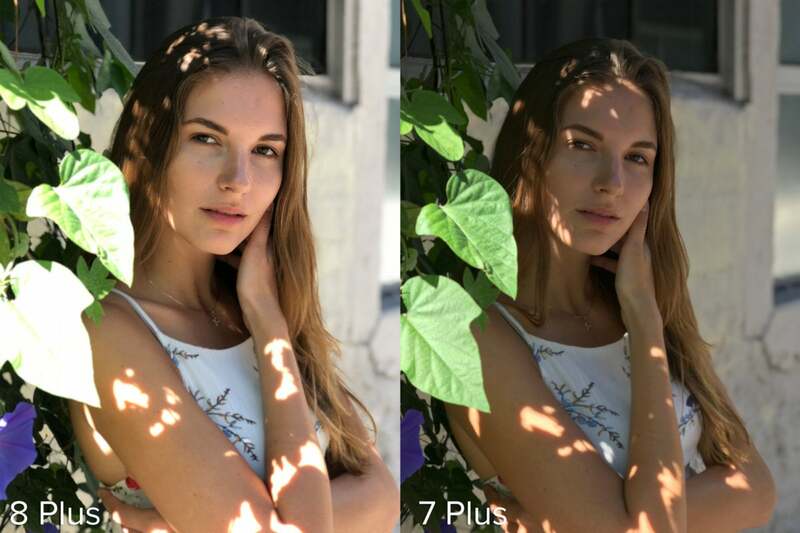 The iPhone 8 Plus doesn't appear to be much of an upgrade in terms of its camera, so we pitted it against the iPhone 7 Plus in a series of intense photography tests. iPhone 8 Plus vs. LG G6: Which has the best camera in a smartphone? Every new iPhone poses the same question: Are the improvements awesome enough to warrant an upgrade? Well, there are tons of reasons to upgrade, but for this article we’re just comparing cameras. Specifically, I put the iPhone 8 Plus against last year’s model, the 7 Plus, to see how much Apple has improved its camera game. 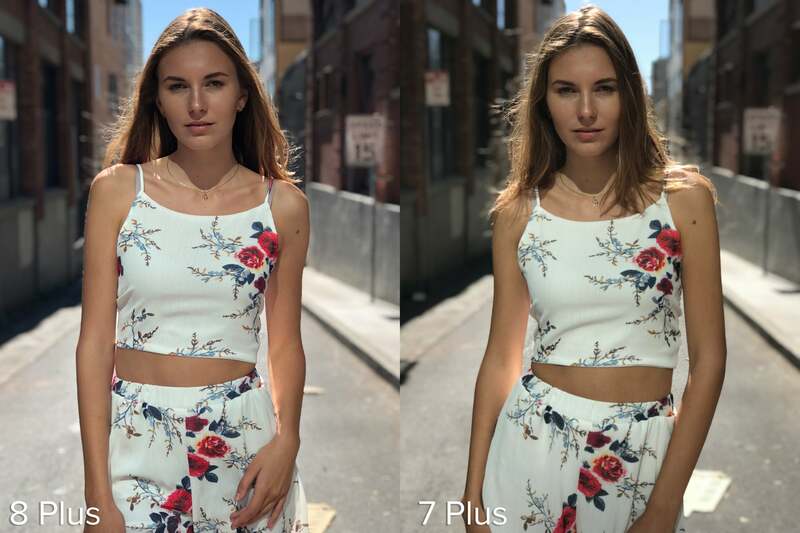 On the surface there are many similarities between the iPhone 8 Plus’s camera and iPhone 7 Plus. A quick glance at specs doesn’t reveal too much. Both cameras still rock dual 12-megapixel setups, with the normal lens at an aperture of f/1.8, and telephoto lens at f/2.8. Unfortunately, only the normal lens has optical image stabilization (OIS), even though stabilization would be even more useful on the telephoto lens, as its more sensitive to camera shakes. 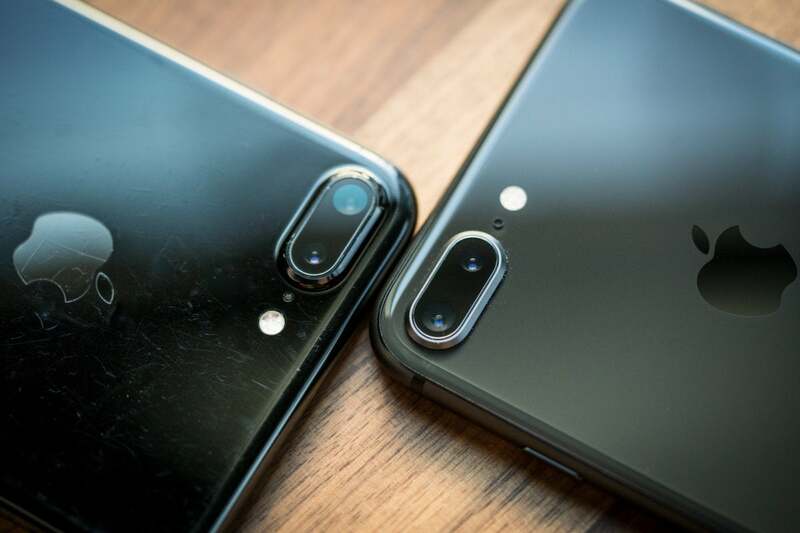 Nonetheless, the 8 Plus does upgrade its Sony sensor, which has so-called “deeper” pixels, and is more power efficient. But, for the most part, the raw specs look the same. So, let’s cut straight to the chase and check out how the photos look in side by side comparisons. 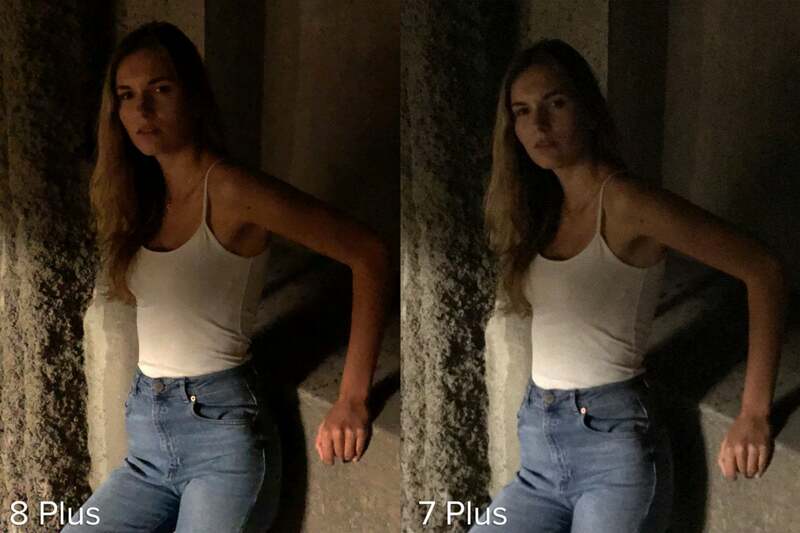 For these tests, we worked with the lovely model Valeria, and did our best to put the two smartphone cameras in tough lighting situations. Afterward, I brought the photos into Adobe Lightroom, and what I found in the iPhone 8 Plus is pretty damn impressive. 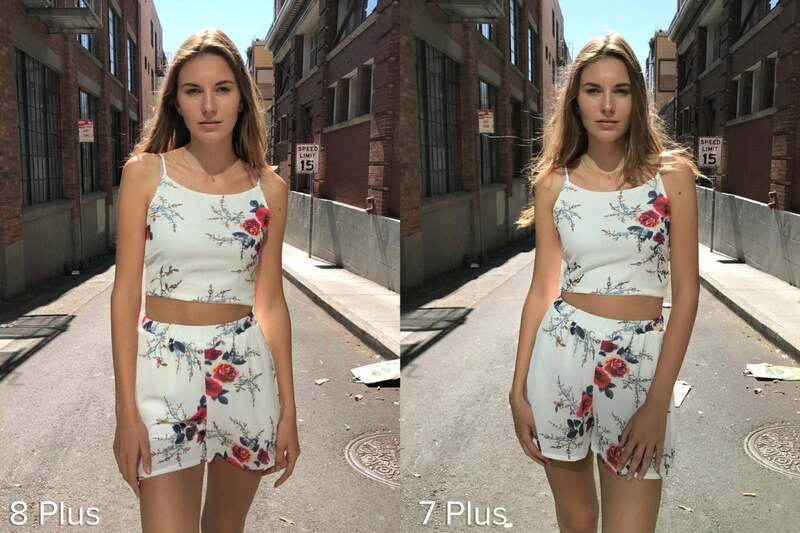 Right off the bat, we see big improvements in color balance. I’ve always been critical of Apple for inaccurate white balance, but the 8 Plus finally gets it right. 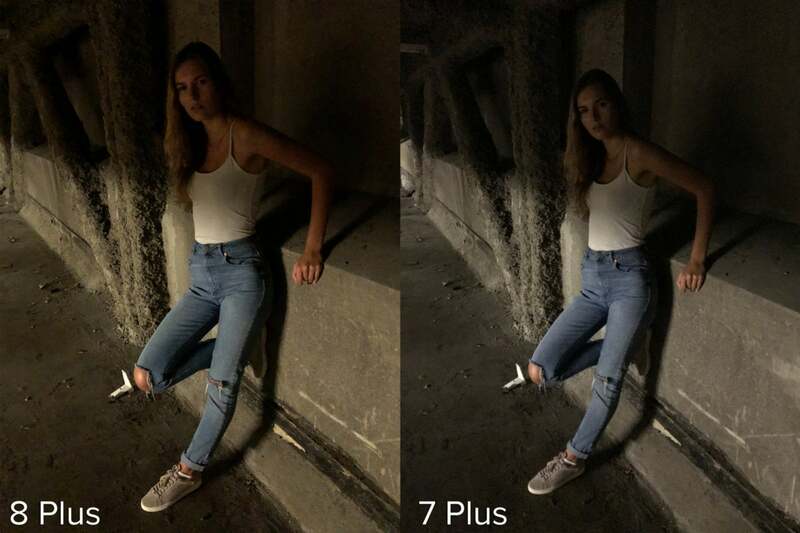 Check out the image below: Skin tones look so much better on the 8 Plus, even in low light. Apple boasted about having a new color filter inside the lenses, but I think some of the better color reproduction comes down to more accurate processing on the software side. 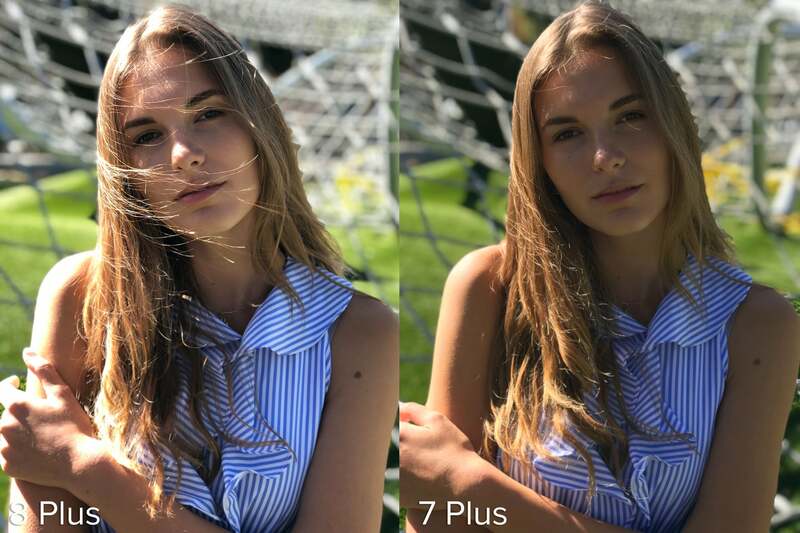 In this Portrait Mode photo, we see a night and day difference in color balance. The 8 Plus has the best skin tones I’ve ever seen on a smartphone camera. Inside our studio, its the same story. The redness of the brick walls are more pronounced and accurate to the eye on the 8 Plus. 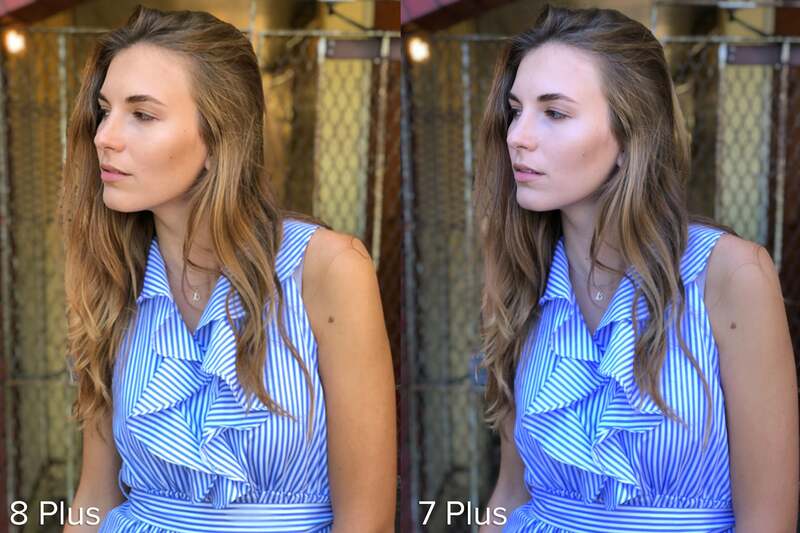 The 8 Plus maintains accurate skin tones, even in low light. Speaking of low light, the iPhone 8 Plus performs much better than the 7 Plus when the lights go dim. Check it out: We went into one of the darkest parts of the basement and the results are obvious. I still wouldn’t recommend shooting photos in such a dark environment, but if you need to shoot in low light, then know you’ll get better results from the 8 Plus. Both cameras hold their own fully zoomed out. 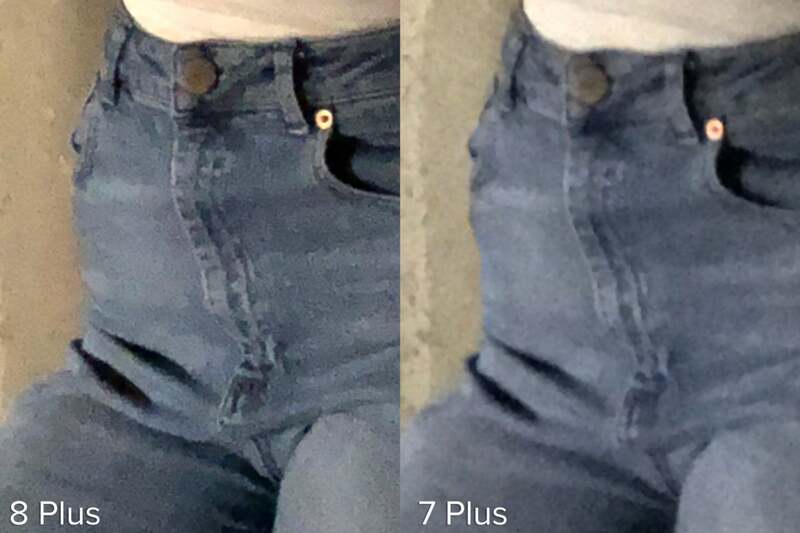 But cropped in, we can see how much more detailed the models jeans are on the 8 Plus. In one of the darkest corners of the basement, both phones struggle. We can see more chroma (color) noise on the 8 Plus, but it’s definitely a sharper image. Even shots taken with the telephoto lens are better on the 8 Plus. It’s a small difference, but every little bit helps in low light environments. 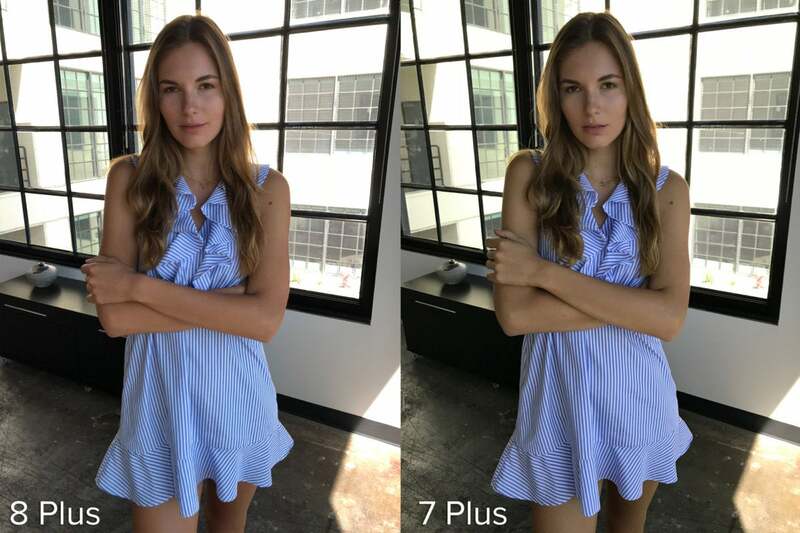 In almost every single photo, the iPhone 8 Plus was noticeably sharper than the 7 Plus. This is due to sharper lenses and the new Apple-designed image signal processor. 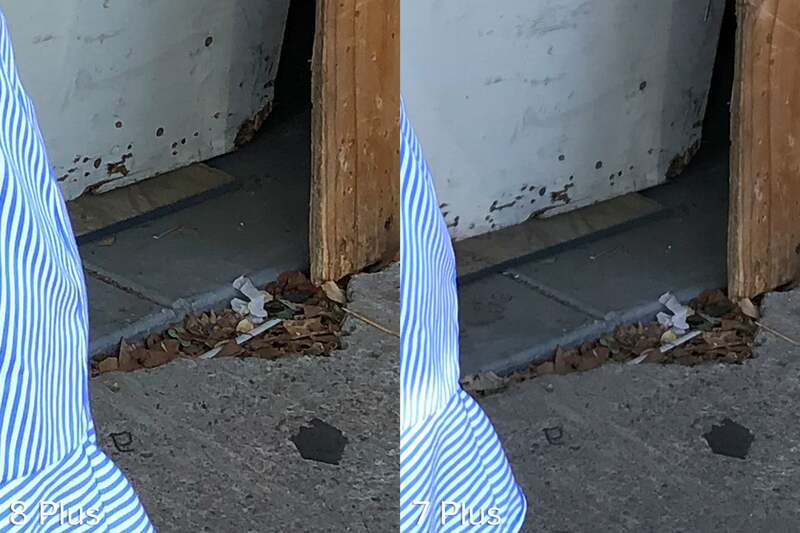 Most people don’t pixel peep the way I do in the following sets of photos, but I still think the results show the 8 Plus’s superior clarity, even fully zoomed out. At first glance, both photos seem equally sharp. 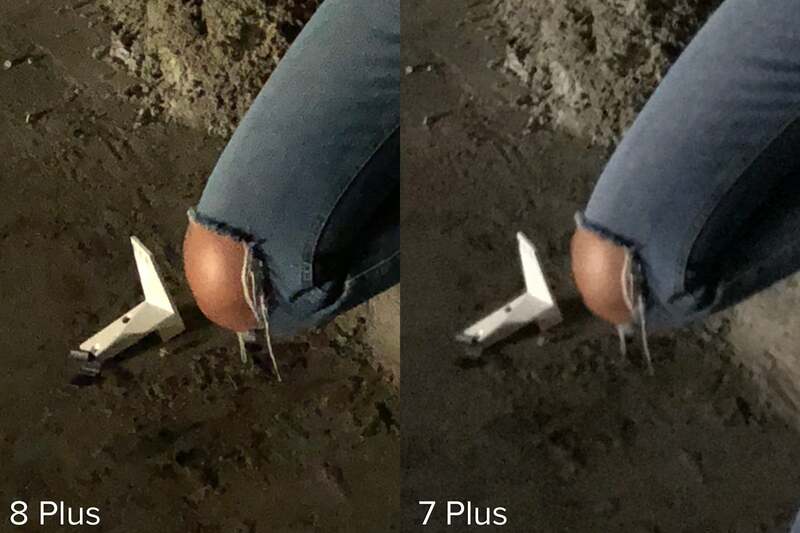 Cropping in reveals cleaner edges around the model’s feet. Every type of lighting situation produces the same results: The iPhone 8 Plus takes clearer photos. So much more detail emerges in the shot taken with the 8 Plus. Some shots are closer than others, especially in well lit scenes. But cropping in reveals finer detail on the model’s top. For all its superior performance, I did come across one interesting quirk on the 8 Plus: In some situations it tends to expose brighter than the 7 Plus. And it only seemed to happen while shooting in Portrait Mode. Right out of the pocket, it’s a punchier photo, and technically Valeria’s face is exposed properly. But in some ways I’d rather have the darker photo in order to have more dynamic range to play with in post. So It’s really up to you if you think the 8 Plus holds an advantage. 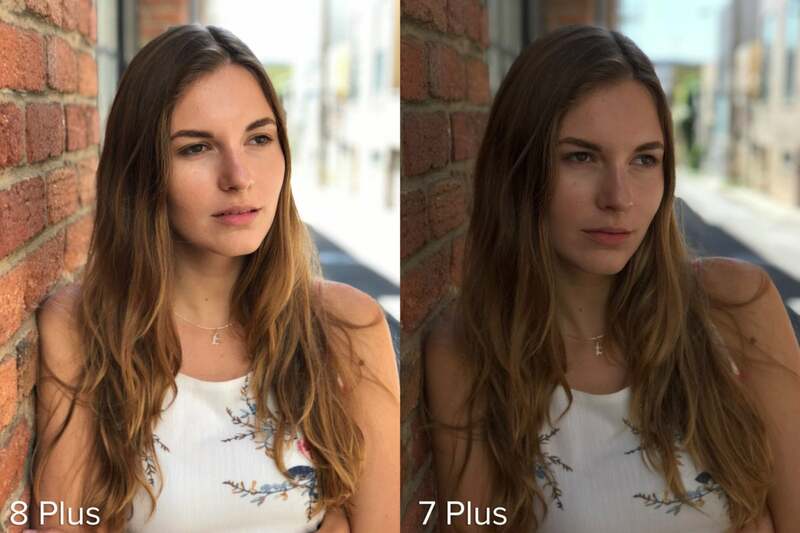 The iPhone 8 Plus blows out the highlights in order to properly expose the model’s face. But this also results in a loss of information. The blown-out leaf on the left is somewhat distracting. But once again, the model’s face is properly exposed. 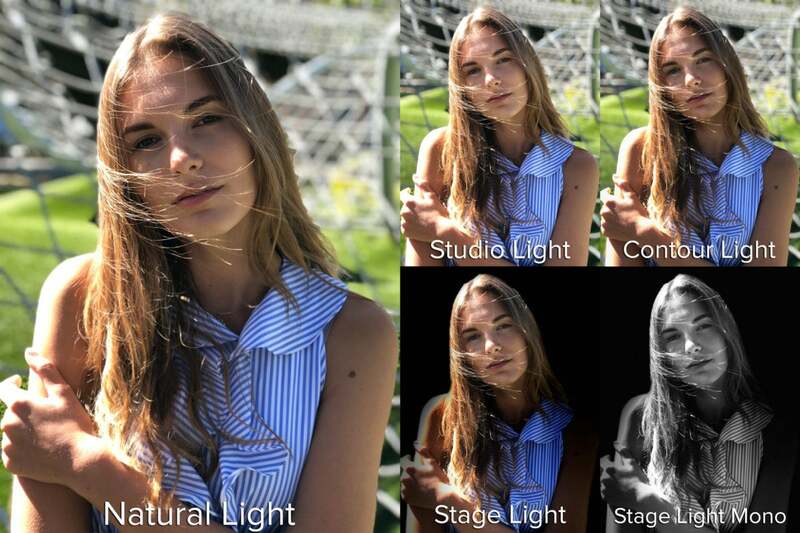 When it comes to Portrait Mode, the iPhone 8 does have a feature that Apple didn’t bring to the 7 Plus—it’s called Portrait Lighting. 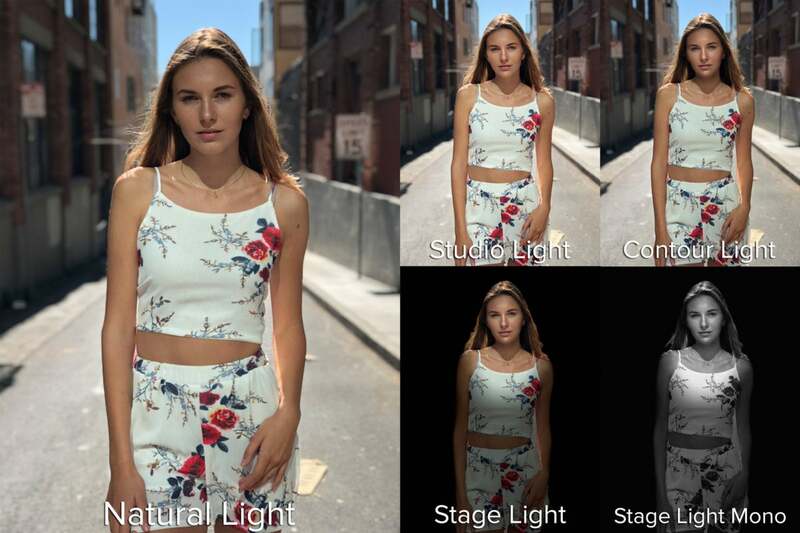 It’s still in beta, but the idea is simple: Apple uses the depth and facial recognition data in the photo to selectively alter the image to recreate a studio lighting effect. None of the Portrait Lighting modes made sense for this shot—unless you’re trying to find a creepy Halloween profile photo. 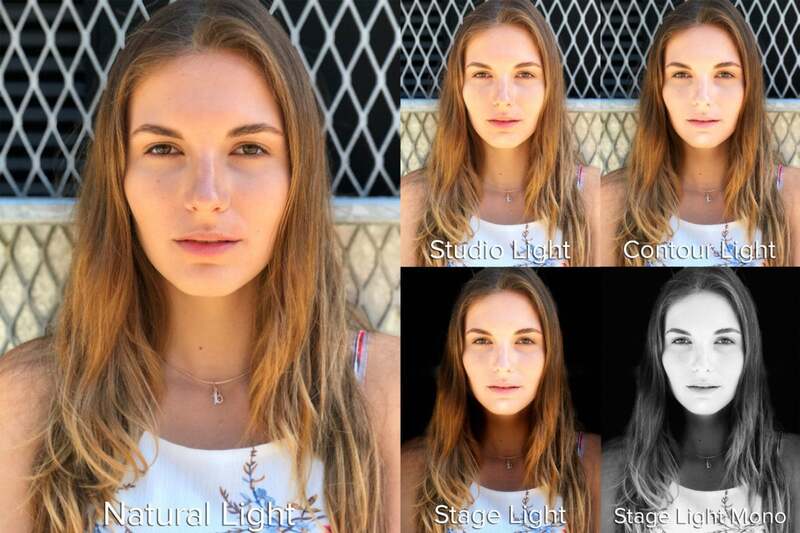 It sounds exciting on paper, but Portrait Lighting delivers half-baked results in practice. In fact, of all the Portrait Lighting modes I tested, I only found one that made sense, and only in certain situations like heavy backlighting. I like the idea of where Apple is going, but as of right now, Portrait Lighting is mostly worthless. This is one situation where the Studio Light mode actually helped the shot. The Contour mode, meanwhile, was almost a viable option. But don’t get too worked up about Portrait Lighting, because the basic Portrait Mode (now called “Natural Light”) is still super fun to play with. I mean just look at the photos below. Even though the 8 Plus struggles with definition around hair—just like the 7 Plus—I’m still surprised every time it takes an awesome shot. Is the bokeh any better on the 8 Plus? I couldn’t really see too many major differences. But you get all the same benefits of the improved sensor, so I’d call the new Portrait Mode a step up from the 7 Plus. Both phones reproduce a pleasing amount of bokeh, or blur, into the scene. Photographers use shallow depth of field tricks like this to direct your eye. I was hard-pressed to find many differences between the depth sensing and bokeh reproduction of each camera. Still, notice the poorly defined hair, where it means the steel jungle gym. Overall, the iPhone 8 Plus is a huge step up from the 7 Plus. Indeed, after looking a bit stagnate for the past few years, Apple has really swung for the fences with its new photography package. I’d never switch over to iOS from Android, but I am definitely envious of this camera. So what do you think? Is the camera enough of a reason to upgrade for you? Or are you going to wait to see what the iPhone X holds? Hit us up on Facebook or Twitter and let us know!